When I used to work at Unpainted Furniture in Rapid City SD, the owner Lori would always give me new ideas of artwork to put on furniture to make it unique. So we decided to make a small foyer set. 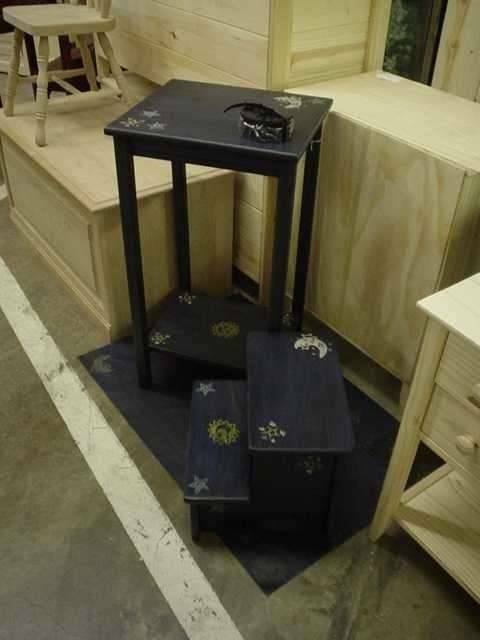 We had just received some new gel stain that we wanted to use so we applied a dark blue gel stain. Then we had some rubber stamps of Stars and Moons so we stamped those designs on the pieces. To finish it off I decided to make a custom floor cloth.